"Can we stop by your store?" "Where do you keep all your inventory?" "You must have a large warehouse"
Well, the answer is yes, it is a big warehouse. It's approximately 2,000 square feet. Imagine a 3 bay garage, but double deep (so you could park 6 cars in here), then add an upstairs, and another 2 car garage on the back. Now fill it all with shelves, add a shipping area, an office area with 2 computers, and voila... my world. -No, we don't have a traditional store. We are sticktly a mail order business. The zoning here does not allow us to have a store for walk-in customers. 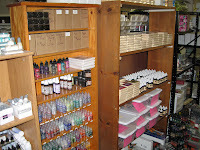 -The inventory is kept in this huge space and we are running out of room. 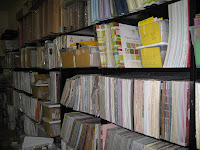 This first picture is the "wall of paper". 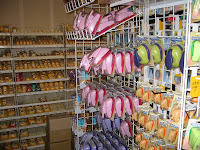 We've outgrown this "wall" and have actually moved on to several other shelves throughout the warehouse. Here is a shelf with some Prima flowers. The brown boxes on top are also Primas (the ones in large tins). 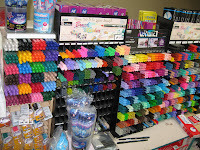 The pens and inks are upstairs. As I said earlier, we are running out of space. What to do? The answer..... drumroll..... build another warehouse. Yep, that's right, we're taking the plunge. We've already secured a line of credit, and a quote for an additional 1,100 sf building. Now for the bad news. The county building department has told us we can't build where we want because they want a 100 ft fire barrier between our fenceline and the new building. Rats. So we are applying for a variance on that. I talked to County Planners and they seem to think it should be no problem, but the plans have to go into review (all at a cost of $250 of course.... you don't expect them to let us do what we want on our land without some money, do you?). Once the fire varience is approved, we then have to pay them a little bit more for the building permit. fun. After that, our builder can order the pre-made building (it's much cheaper to go pre-fab than standard stick-built). That will take 8 weeks. The actual building part should only take about 3 weeks. Pre-fab buildings go up in no time. So hopefully, around September, we should have a new warehouse. Just in time for Summer CHA products to start rolling in. That's the big news here at Frantic Stamper. New warehouse, new shopping cart, we're moving on up!!! To all my loyal customers: Thank you for your continued support. And to my new customers, Welcome! I look forward to serving you all for years and years to come! Busy, busy, busy as usual..... and I forget to add stuff to the blog. This summer, we are working on a shopping cart. It's a long overdue project. One that I have started many times, and dropped many times due to lack of time to finish it properly. So I've actually hired someone. 2 someones to be exact. 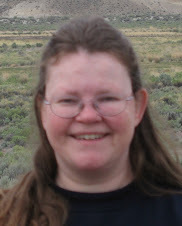 I've hired Adelina from New Zealand as a consultant and technical advisor. Adelina will be making all the techincal updates to the site, making things look pretty and work properly. I've also hired Betsy. 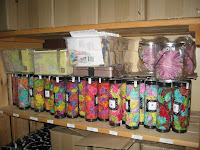 Betsy is working in our warehouse and she is in charge of adding all the products to the site. She's been working on the cart for about 2 weeks now and already has over 3,000 products added. To change subjects a little, here is a card I made a couple years ago. It's simple, but striking (I think).